The Culture24 website (formerly the 24 Hour Museum) is an award-winning cultural guide promoting museums, galleries, libraries and archives across the UK. Every month, at least a million visitors enjoy content on Culture24 and Show Me, along with a host of micro sites powered by the Culture24 database. Core innovations of the site include an intention to make the best use of cutting edge Web 2.0 ideas like RSS, User Generated Content and making data free via API outputs and Web services. SSL work closely with Culture24 to provide and maintain software infrastructure including a powerful Index+ web content management system, and the database that underpins the growing Culture24 family of sites. Visitors can search and browse the full content of Culture24 which includes a gazetteer to UK museums and galleries, reviews of Exhibitions, events listings, News from the sector, interactive Trails, activity-based resources, search facilities and much more. Core data for the various Culture24 sites is sourced largely from an easy to use Direct Data Entry facility enabling museum professionals to update and maintain information relating to their own institution, its activities and resources. 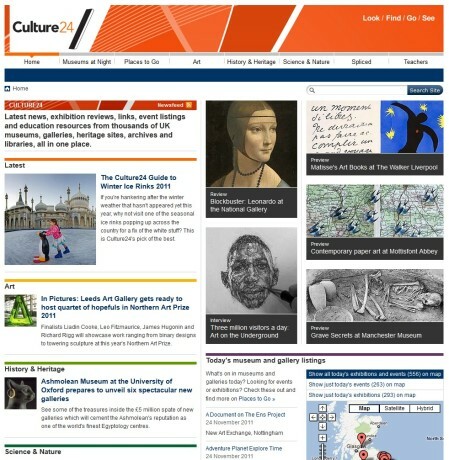 Culture24 and SSL lead the UK museum sector in the development of RSS newsfeeds for public-facing website use. With our technical help, newsfeeds are available for all UK regions including 10 English cities and Welsh and Scottish feeds. Show Me, currently reaches around 250,000 kids per month at home, and in the classroom. The site brings together the best digital content for children from UK museums and galleries in one easy-to-access place. The site includes a wide variety of interactive activities developed in collaboration with a number of national museums. As well as showcasing the work of others, Show Me staff write topical and fun news stories, and put together resources for teachers and info for parents looking to make museum visits with their kids. We built and supplied the software infrastructure that powers the site.